Russian secret-spilling site Dossier steps into spotlight. American voters encouraged to clone it for USA. LONDON (AP) — Over the past three months, a handful of highly placed Russians have discovered their secrets seeping onto the web. Last week, Natalia Veselnitskaya, the Russian lawyer who met with President Donald Trump’s son during the 2016 presidential campaign saw her ties to senior Russian government officials laid bare in an Associated Press investigation. The man behind the disclosures tells the AP that more are coming. “We have no shortage of material we’re currently evaluating,” Russian opposition figure Mikhail Khodorkovsky said in a television interview last week from his office in central London. The venue for these recent stories has been Khodorkovsky’s new project, dubbed the “Dossier Center” and launched in November. The center bills itself as an investigative unit and its website features a sprawling, interactive diagram of interconnected Russian officials described as the “main beneficiaries” of Russian corruption. Khodorkovsky said the center, which the exiled former energy executive is funding out of his own pocket, was born out of frustration with the inability of journalistic investigations to lead to real change in a Russia dominated by his foe, President Vladimir Putin. He wanted the Dossier Center to go beyond the occasional story and gather enough actionable information on the Kremlin’s leadership to bring its members, eventually, to court. “We understand it’s a long-term ambition,” he said with a smile. By Khodorkovsky’s telling, the center gets its data from a series of anonymous digital drop boxes. The leaks carry evidence not only of high-level corruption in Moscow but also of the Kremlin’s “illegal attempts to influence Western public opinion and Western politicians,” he said. If Khodorkovsky’s business model — to receive leaked data anonymously and share it with journalists — sounds a bit like the early days of WikiLeaks, Dossier Center staffers bristle at any comparison. The Dossier Center says it rejects the indiscriminate information dumps that made WikiLeaks notorious. Its five full-time staff members cross-reference incoming data to verify it and sift through files with an eye toward what might help build a legal case or feed a news story. In any case, Khodorkovsky said his group has a fundamentally different mission than Julian Assange’s radical transparency organization WikiLeaks. “Our ambition is not simply to expose information in general, but to use material relating to Putin’s circle and his allies so that they can be put on trial in Russia,” he said. Khodorkovsky was Russia’s richest man before he was imprisoned in 2005 for tax evasion in what was largely seen as the Kremlin’s payback for his political ambitions. Putin pardoned him in 2013, just a few weeks ahead of the 2014 Winter Olympics in Sochi, but the feud lives on. From exile, Khodorkovsky supports an array of civil society groups in Russia, and authorities in Moscow continue to investigate him on a variety of charges. The Russian Embassy in London said in response to a question about Khodorkovsky’s project that rooting out corruption was one of Moscow’s top priorities. In an email, it invited anyone “who has data on corruption” to contact Russian authorities. 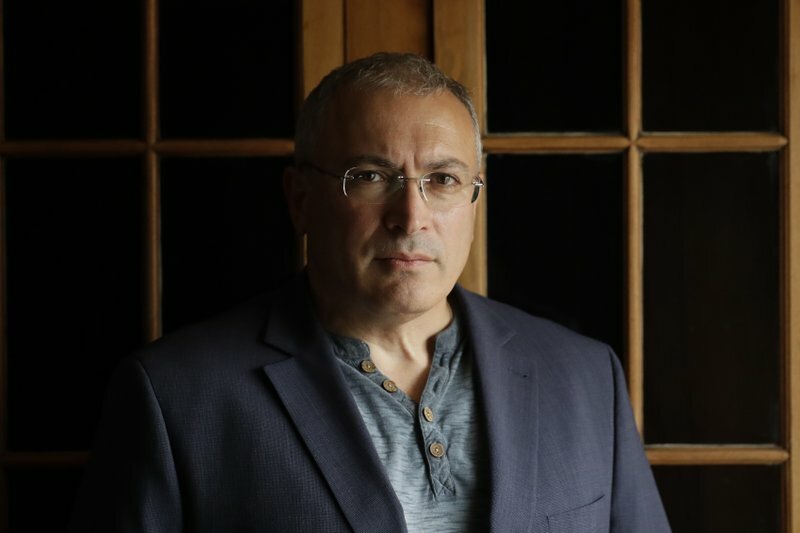 Khodorkovsky said the laser focus on Russia meant his group would avoid taking sides in American or European politics, even if it came across evidence of Russian government interference. Although the Dossier Center itself has remained relatively low-profile — the group had barely more than 100 followers on Twitter as of early Tuesday — its stories have attracted attention and a trickle of reporters have been making their way to the center’s door over the past couple of months to discuss potential stories. The provenance of the Dossier Center’s data remains a mystery. Khodorkovsky said some of his sources — the ones that asked for money — identified themselves to the center but that many others didn’t. At least one of those Russians exposed by the center’s investigation, Veselnitskaya, has alleged that the emails the center worked from were the result of hacking. The murkiness of the material’s origin does not in and of itself disqualify Khodorkovsky’s group as a source, said Frederik Obermaier, a senior investigative reporter with the German paper Sueddeutsche Zeitung who shared a Pulitzer Prize last year for his role in the Panama Papers tax haven revelations. “If I came to the conclusion that it’s authentic and it’s in the public interest, I would — with a certain and important portion of caution — try to work with the material,” he said in a telephone interview. Transparency about where leaked data comes from has shot up the media’s agenda following the 2016 U.S. election hacks. Some argue the American journalists were manipulated into publishing stories based on hacked material without paying enough attention to the motives of those releasing it. Ever since there has been an anguished debate over the propriety of dealing with material that mysteriously appears in the public domain. The question is a fraught one for Khodorkovsky too. Targeting data obtained by the AP last year from the cybersecurity firm Secureworks shows that he and his entourage were repeatedly targeted by the same group — allegedly Russian military intelligence officers — that humbled the U.S. Democrats in 2016. Several batches of emails from people within Khodorkovsky’s orbit were subsequently published to a now-defunct Russian-language leak site in an apparent bid to sully their reputations. But even having been targeted by hackers doesn’t mean Khodorkovsky rules out accepting documents suspected of having been hacked. He told the AP he would weigh such material on its merits, suggesting that the brutal environment of Russian politics, where opponents of the government can be gunned down and poisoned, didn’t leave much room for squeamishness. “I’ll say this to you, weighing it up in my own moral balance. If I think that this information might prevent such things from happening then I don’t give a damn how it was obtained,” he said.